I had no idea that Brussels sprouts grew on stalks till I moved to California, quite a few years ago now. In those days we could only buy stalk sprouts directly from coastal farmers at roadside stands. Nowadays we see them at Farmers’ Markets, large-scale produce stands, and even at Trader Joe’s (TJ’s). For years I’ve wanted to try the recipe that TJ’s rubber bands to their stalks. When I finally tried it, it was nothing like I imagined. The outside of the sprout is crispy and caramelized, and the inside is soft and delicate, a delicious contrast. The first challenge with the TJ’s recipe is that the stalk has to be microwaved. Who has a microwave large enough to accommodate an entire stalk? Not home cooks! So, I measured the stalk and cut it from the top to the length that fits into my microwave. Then I rinsed it, cling-wrapped it, and nuked it. Meanwhile, I took the sprouts off the lower part of the stalk, and rinsed, wrapped, and nuked them. 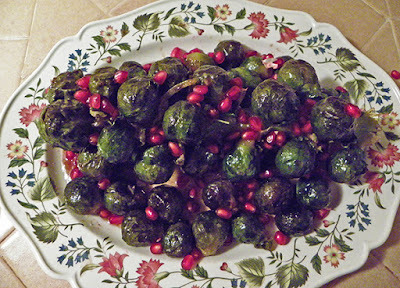 Then I put the stalk into a baking pan, surrounded by the individual sprouts, and poured the glaze over all. The stalk-plus-singles strategy roasted well, and made a pleasing display on the serving platter. I also altered the TJ’s recipe thus: (1) reduced the maple syrup by 1/3, (2) added a bit of stoneground mustard to compliment the sweetness with a bit of vinegar and spice, and (3) substituted walnut oil for olive oil to add nuttiness. Other flavorful oils (almond, hazelnut, dark olive, etc.) will work too. Reducing the ratio of maple syrup to oil changes the glaze properties so it’s less likely to stick to the baking pan or burn. TJ’s recommends garnishing with pomegranate seeds or dried cranberries. Either provides a holiday-friendly contrast in color. 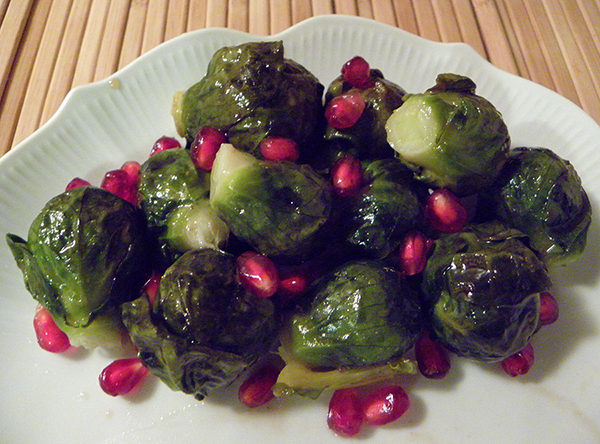 But the pop of sweet-tart freshness that the pomegranate adds to the dark smoky sweet flavor of the sprouts makes them the better choice. And luckily, we are in the midst of the short pomegranate season. Try this festive-looking dish for holiday parties and potlucks. 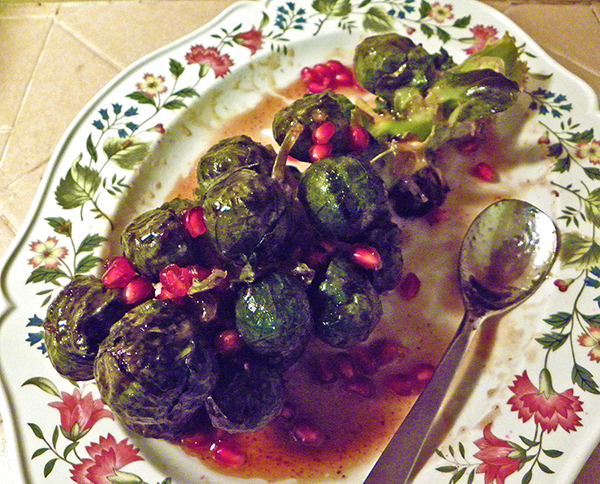 The unexpected appearance of Brussels sprout stalk at the table, garnished with fresh pomegranate, will spark many a conversation. Measure stalk against microwave and baking pan, measuring from the top of stalk. Cut stalk so that top piece will fit into microwave and baking pan. Rinse top stalk and wrap in cling wrap, sealing completely. Place in microwave on high for 5 minutes. Set aside, still wrapped up. While stalk is microwaving, cut sprouts from lower half of stalk. Rinse and wrap in cling wrap. Place in microwave for 5 minutes. Keep wrapped up. Unwrap stalk and place in center of baking pan. 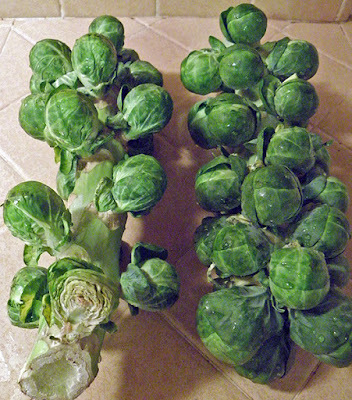 Unwrap individual sprouts and place around stalk. Make glaze by combining walnut oil, maple syrup, and stoneground mustard with immersion blender. Pour over stalk and individual sprouts, taking care to glaze all sprouts. Place baking pan in preheated oven. 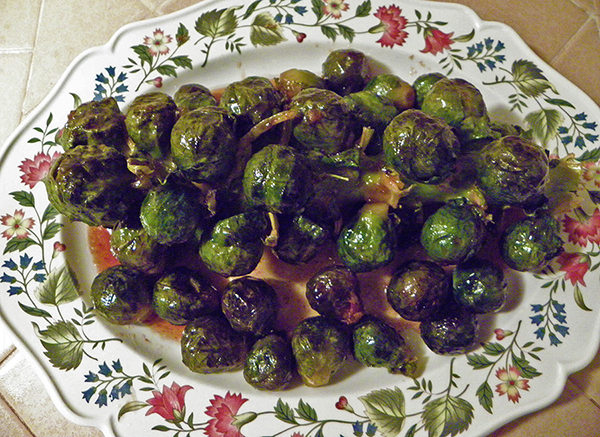 After 20 minutes, flip stalk and individual sprouts and brush with glaze. Return to oven. Bake another 15 – 20 minutes, until sprouts are soft on inside when fork-tested. 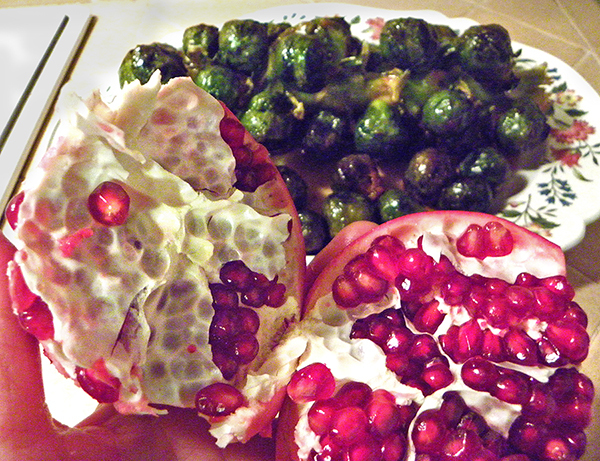 While sprouts are baking, prepare pomegranate. Try this Instructables method for easily releasing the seeds. Remove sprouts from oven. Place stalk on serving platter and surround with loose sprouts. 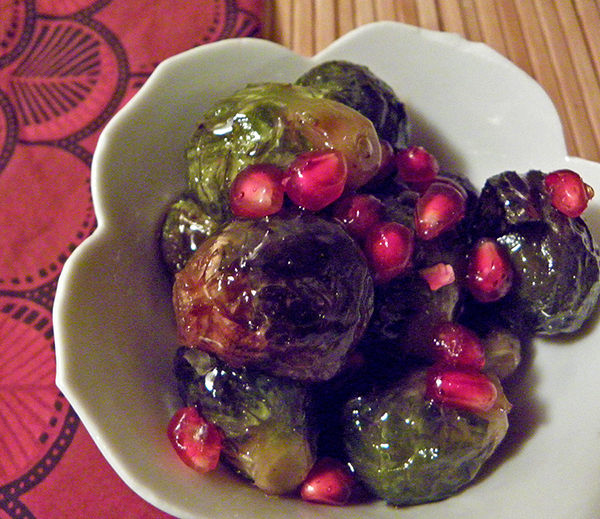 Pour the glaze from the pan over all of the sprouts. Sprinkle with fresh-ground salt and pepper. Garnish with pomegranate seeds and serve immediately.